Explaining the SDGs in a three-minute video – mission impossible? 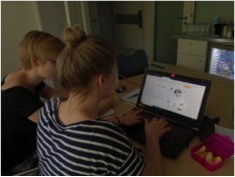 That’s what we thought as we started the project “Explain” in cooperation with the simpleshow foundation at the University for Sustainable Development in Eberswalde. The project took place within the framework of the volunteer initiative, an initiative with the aim to inform the public about the sustainability goals and, at the same time, to give people the possibility to become active themselves by sharing their created videos. We had three months and a lot of motivation to figure out how to make this happen. As we study sustainable tourism management, we focused on two goals which seemed to be the most relevant in the tourism context: gender equality and responsible consumption and production. The project began with a design thinking process which helped us in defining our challenge and organizing our work. We decided to split the original group into two, so each group could focus on one goal. Results of the Design Thinking process. After some intensive research, we started with the most exciting part of the project: the creation of the video. 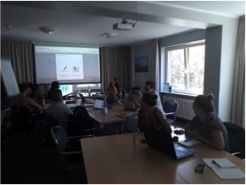 We were very lucky to have a workshop where we not only got to understand the software but also received input about how to write a storyline and about how the content is perceived by the people watching the video. The challenge here was to create a video that can be understood by people of various cultures, ages, and backgrounds all over the world. Therefore, the language had to be simple and clear, avoid complicated grammar structures and be as engaging as possible. Confronting ourselves with the process of creation for the first time, we soon realized that we had to reduce the amount of information we wanted to put into the video. In order to do so, we decided to focus on only one aspect of the goal per video. “Keep it simple” became our motto from that day on. Based on the received knowledge, we started working on an actual storyline. In order for the viewer to identify him- or herself with the story, we decided to create one or two protagonists per video. The main difficulty here was to conceptualize an educational video without being too instructive or judging by pointing out what the viewer should or should not do. Our characters had to undergo a development process within the video and realize themselves that they should change their behavior. To bring about this change, we defined three key messages per video and ended our stories with a call to action directly addressing the viewer. Working on the visualization process. Although we were free to choose the plot of our story, the software presented some restriction. Since the number of words we could visualize was limited to 7 per frame, we often had to adapt our text to the framework of the program. However, this forced us to pick our words more carefully, especially regarding the visualization process, as not every word could be visualized in a way the audience would understand. Finally, we had to decide on an audio we were going to use. For the video to be more authentic, we preferred to record our own voices. Easier said than done. Making a good audio is all about timing and using the right intonation. After some practice, we managed to record a nice audio (or at least, we hope so). Looking back at this explanatory journey, we had a great time figuring out how to make the impossible possible. Mysimpleshow is the James Bond of the explanatory video software, a really useful tool which enables you to transmit a complex message in a simple way. And now, enjoy the videos and travel responsibly!